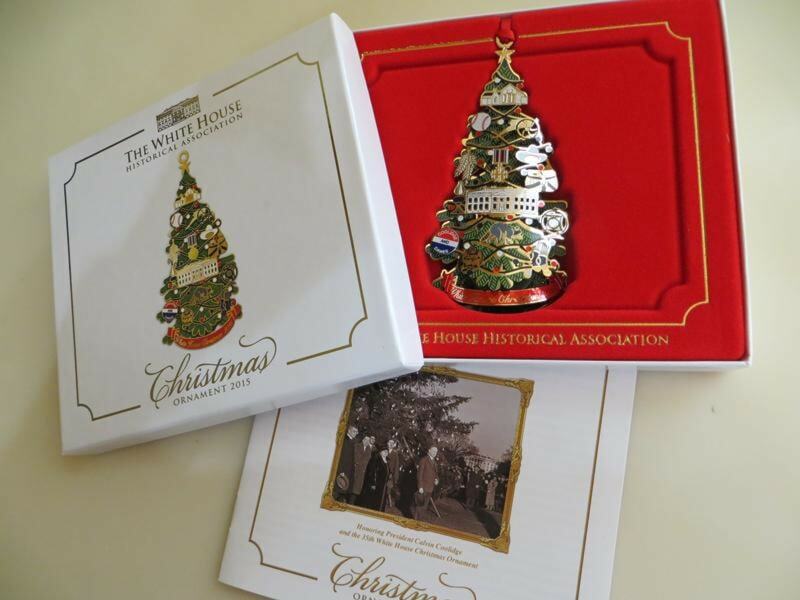 This beautiful official White House Historical Association ornament celebrates the Coolidge presidency. It is a 24k gold, brass and nickel plated ornament that has an internal light. It's proudly made in America, and represents the first National Christmas tree that started a tradition. 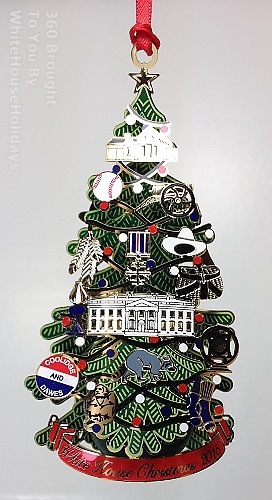 The ornament has 14 ornaments representing all things Coolidge, from campaign buttons to his trademark cowboy hat. 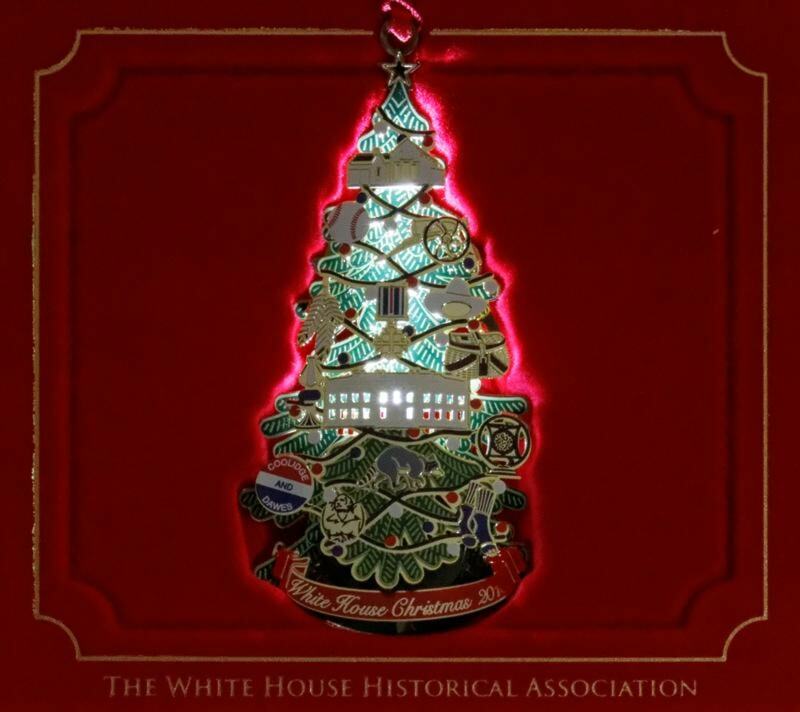 The 2015 Official White House Historical Association Christmas Ornament honors the administration of President Calvin Coolidge, which initiated a Christmas tradition that has continued to this very day. On Christmas Eve 1923, the Coolidge's participated in a series of celebrations. At 5:05pm the President pressed the button that illuminated the 3,000 light bulbs on the first National Community Christmas Tree on the Ellipse. With a fanfare of trumpets, this symbol of the spirit of Christmas was converted into a national emblem signifying that the celebration of Christmas had begun. 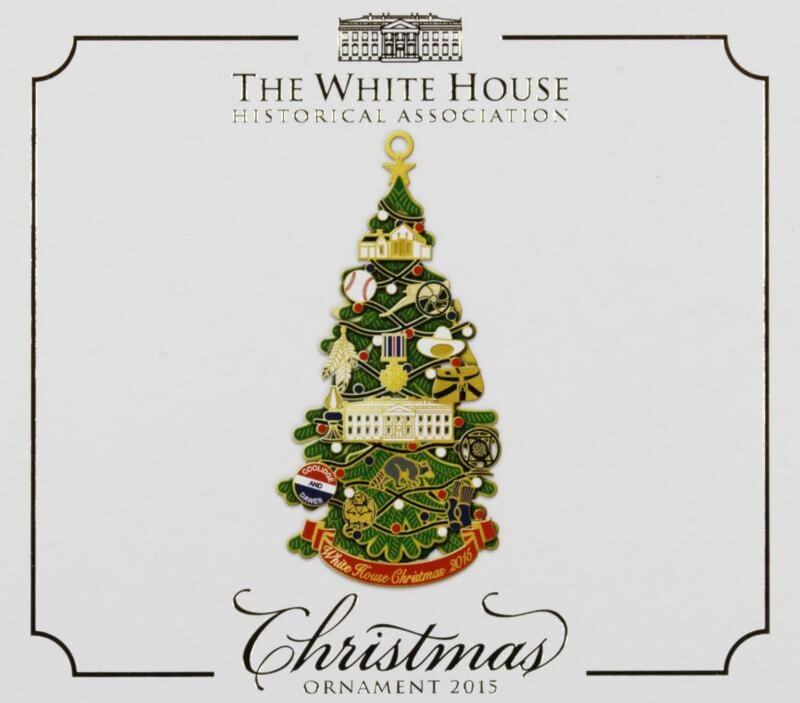 * Important: The 2015 Official White House Ornament features a double sided Christmas tree with ornaments hanging from it representing many facets of our 30th president. The unique feature of this ornament is an attempt to combine technology with the design. The ornament was created to light up from the inside with a light bulb and small battery that is estimated to last many hours, but is not guaranteed by the American manufacturer, ChemArt. Neither the bulb nor the battery is replaceable and we cannot replace depleted or defective batteries. Thank you for your understanding. The ornament, alone, serves as a beautiful decoration on your holiday tree and can be enjoyed for years to come, along with your other White House ornaments. His first Christmas in Office, President Coolidge gave no speech at the ceremony. The program included a choir from the Epiphany Church accompanied by a quartette from the Marine Band, which led the crowd of thousands in singing Christmas Carols. At 7pm the full band performed a holiday concert. At 9pm, 65 members of the First Congregational Church filed out of the White House singing the first of many Christmas Carols. A reporter for the Washington Post said, "So the nation, so the world, welcomed the advent of the 1923 Christmas." 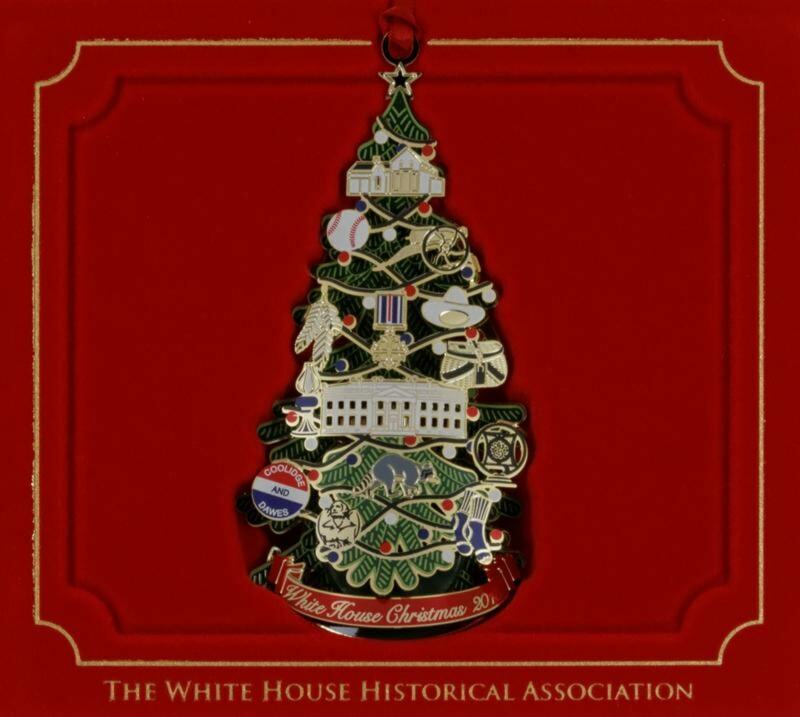 For more about President Coolidge's thoughts on Christmas, along with stories of the Christmas traditions of the presidents since Coolidge, we offer the exclusive Season's Greetings From the White House book, a collection that speaks to Presidential Christmas Cards, Messages and Gifts from past presidents.